Giri Cavale is a renowned wildlife photographer, photography mentor and co-founder of Toehold, India’s leading travel-and-photography company. 'Born in Bangalore but reborn in the wild' captures the essence of Giri's obsession for nature and its eloquent portrayal. His mercurial senses are always in search of an exceptional experience and his seasoned expertise keeps him always ready for a memorable image. Giri’s passion for photography was born out of his love for the wilds, which was instilled in him from a young age. 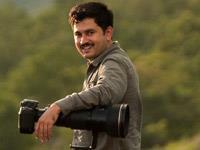 Armed with this experience, almost unfaltering intuition, a deep connection with his subjects and tremendous skill to make opportunities count, Giri has captured some truly unforgettable moments in the most enchanting wildlife areas. When in the wild, people believe where there’s Giri, a fascinating wild encounter is never far away, and Giri is equally passionate about sharing his treasure of knowledge, as he is about using photography as a powerful tool of communication. Famous for his stunning body of work with the elusive cats and other wildlife of the secretive southern Indian jungles, Giri has won the coveted gold medal at the 17th Nature Biennial World Cup by the FIAP in 2014 and second prize at the Sanctuary Asia Wildlife Photography Awards in 2013, and been featured in numerous prestigious publications.